Yeye Teish (gold shawl), Iya Oshogbo (orange head-wrap) seated next to the alar along with Ile members, greeting and guiding participants in preparation for the ritual. 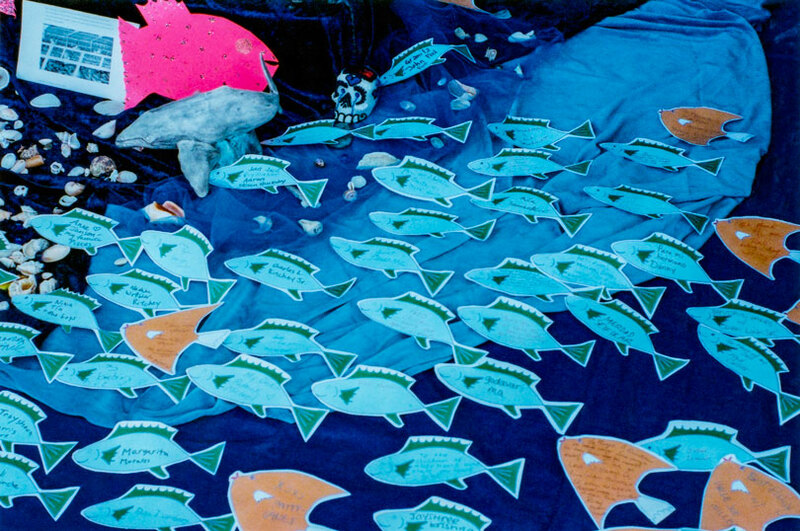 Visitors to the museum were invited to write prayers on cutout paper fish and add them to the waters. Iya Oshogbo, Awo Fanira, Iya Ayokunle, Gail Williams, Diane Rathey, Emaia. 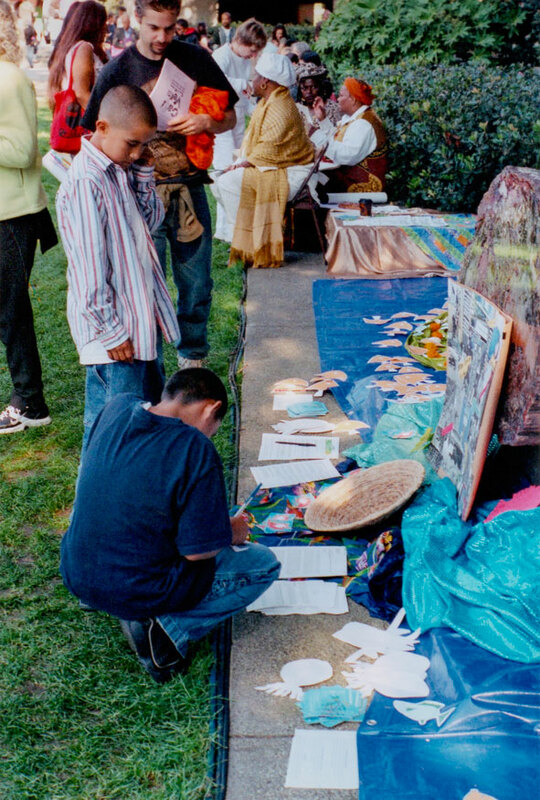 We began building the altar early in the day in the museum garden. The woman on the left is a museum volunteer talking to Iya Oshogbo (orange headwrap) and Diane Rathey (dressed in white). Oshun and the sweet waters part of the altar is on the left. In the center is a basket and a collage of photographs of New Orleans and the Gulf placed in front of a large stone—actually a petrified tree (permanently installed). 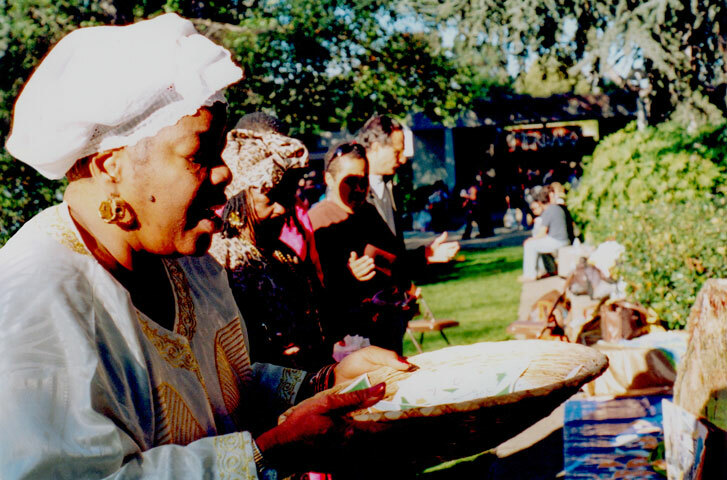 The right side of the altar celebrates Yemaya-Olokun and the Ocean waters. 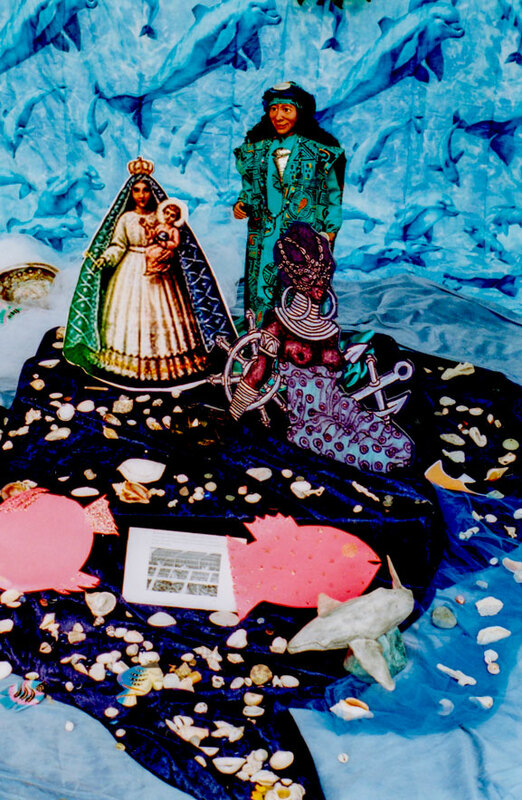 The Ocean waters section of the altar with an image of Yemaya Yoruba goddess of the Ocean and La Virgen de la Regla along with an Egun (ancestor) doll. 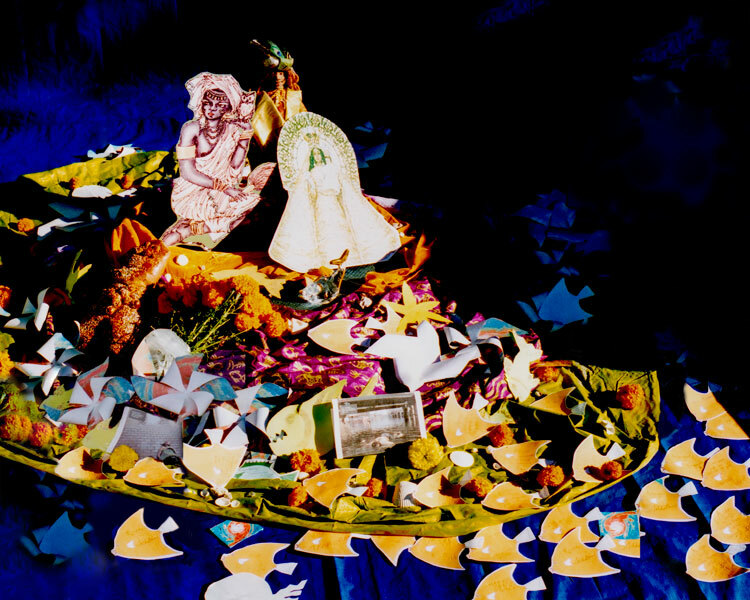 Center of the altar with the basket, photo collage of news stories, and fish swimming in front and around. 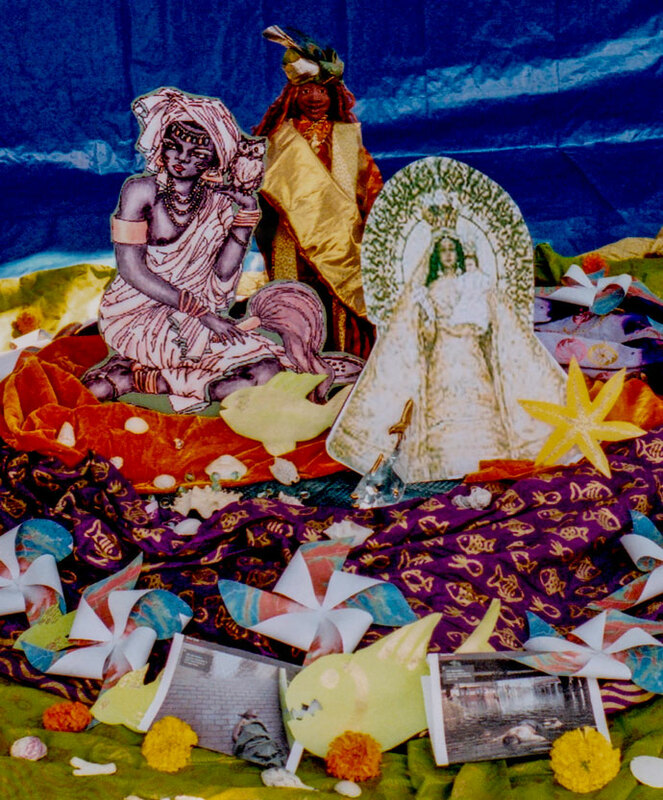 Section of the altar dedicated to sweet waters with Oshun, Yoruba goddess of rivers, La Virgen Caridad del Cobre, and an Egun (ancestor) doll. 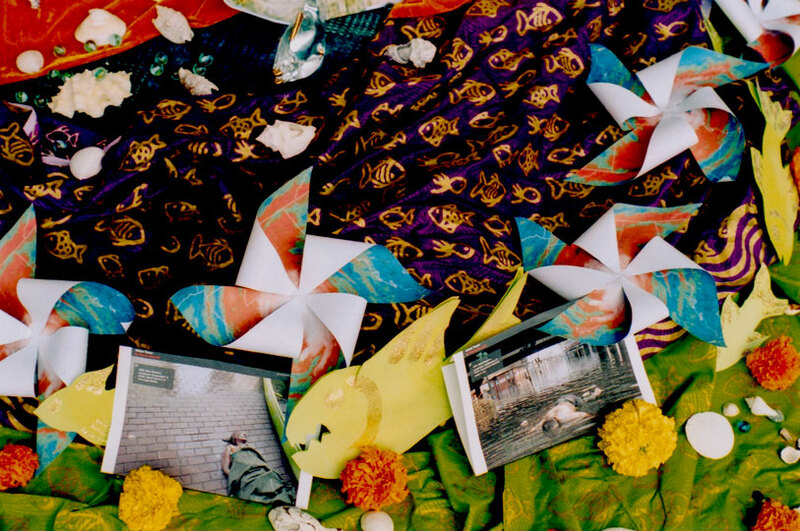 Section of the altar dedicated to sweet waters at the end of the day filled with fish prayers. 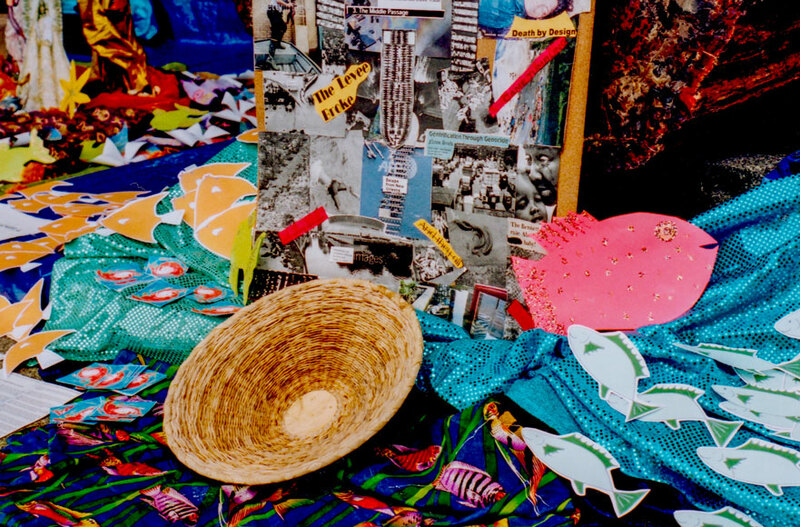 Detail-a closeup of the sweet waters section showing photos of victims in the devastation. The Ocean waters section with many fish prayers swimming to the deep. At the end of the day, Yeye Teish led a ritual of Prayers and Songs. Mojuba o, love and respect to beloved Souls beneath the deep.